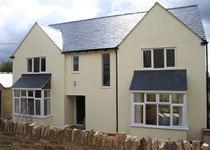 We use the Dulux Weathershield paint system on external walls and woodwork. We mainly work of ladders - saving householders the cost of scaffolding. Before painting, interior walls are 'made good'; cracks filled and surfaces sanded down. Powder-based fillers are used on flat areas and flexible fillers used in corners and on joints. based paints, we can use water-based woodwork paints instead. finish), gloss (very shiny, very durable). the room & cover and put floor-covers over all the carpet. Walls: first loose render is scraped away, deep cracks are opened up with angle grinder, powdery areas sealed with PVA, exterior grade filler applied, mortar on deeper areas, new filler is sanded down. Wherever practical we will cover the ground below the walls where we are working. Woodwork: rotten wood is burnt/scraped away, wood hardener applied, where necessary new timber introduced & 2-part epoxy wood filler applied. Surfaces are then sanded down, primed, undercoated and glossed. We are based in Torquay, but take on Painting and decorating work in Paignton, Brixham, Dartmouth And Newton Abbot area. mid-shine finish), gloss (very shiny, very durable). Before painting, interior walls are 'made good'; cracks filled and surfaces sanded down. Powder-based fillers are used on flat areas and flexible fillers used in corners and on joints. Rooms will normally receive two coats of emulsion on the walls and ceilings and two coats of oil-based paint (gloss, satinwood, eggshell) on the woodwork. 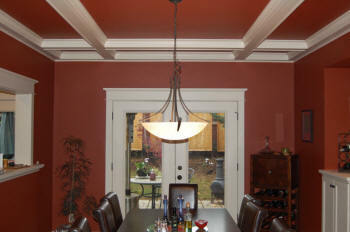 If a customer is allergic to oil-based paints, we can use water-based woodwork paints instead. Wood finishes: eggshell (non-shiny,but can show scuff marks), satinwood (durable mid-shine finish), gloss (very shiny, very durable). We ask clients to remove ornaments/valuables before we arrive. However we are happy for a small additional fee to do this if required. Then we will move the furniture into the centre of the room & cover and put floor-covers over all the carpet. used in corners and on joints. areas, new filler is sanded down. householders the cost of scaffolding. ground below the walls where we are working. are then sanded down, primed, undercoated and glossed. system on external walls and woodwork. deeper areas, new filler is sanded down.